Research Methods in Sign Language Studies is a landmark work on sign language research, which spans the fields of linguistics, experimental and developmental psychology, brain research, and language assessment. 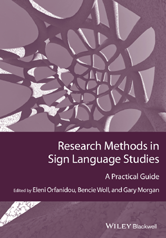 It summarizes all relevant methodologies in sign language research and provides a detailed synopsis of how to do necessary research. What Methodologies Have Researchers Employed to Investigate Literacy in Deaf Individuals? What Are the Issues When Conducting Literacy Research with Signing Deaf Children and How Can We Resolve Them?